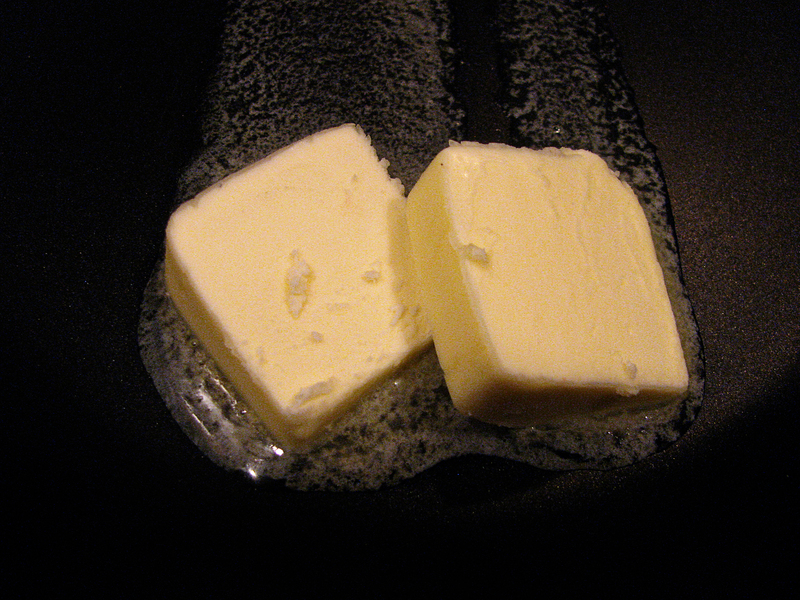 Two pats of butter. Oh yeah, you know it's going to be good. 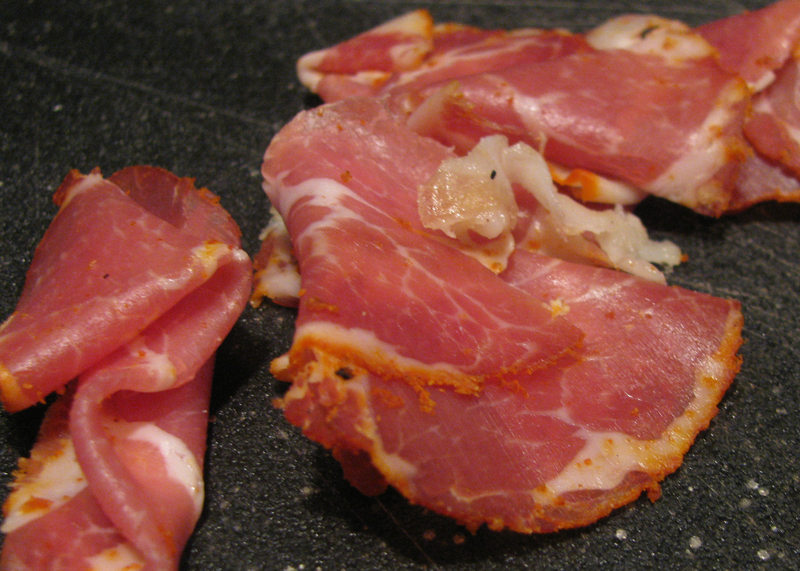 Slightly spicy prosciutto. A little goes a long way. Salty water, vigorous boil. I let it spill allover because my wonderful man cleans up the kitchen after dinner. 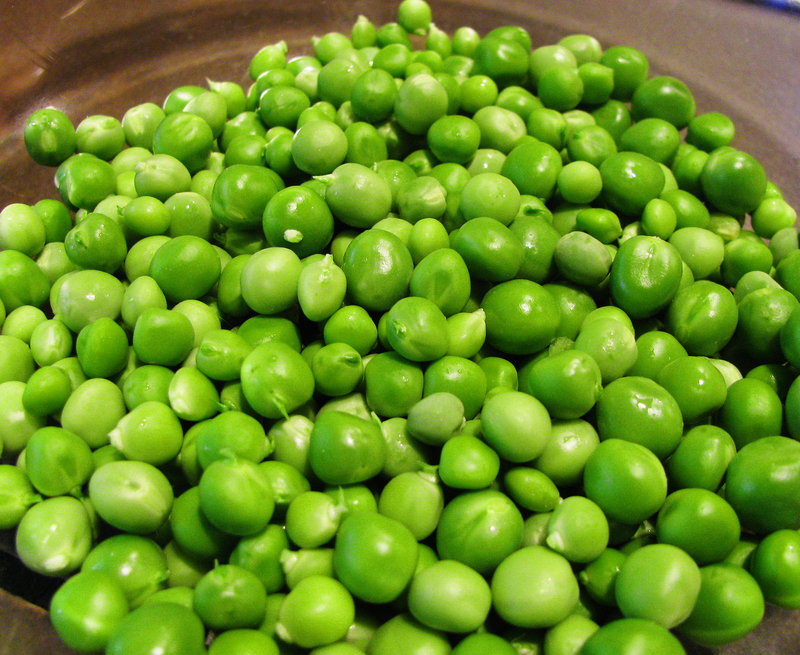 Last weekend, when I picked those peas, I started thinking about making this dish (am I the only one—besides my father—who is always thinking three meals ahead?) and it was so totally worth waiting for. Think sophisticated macaroni and cheese. 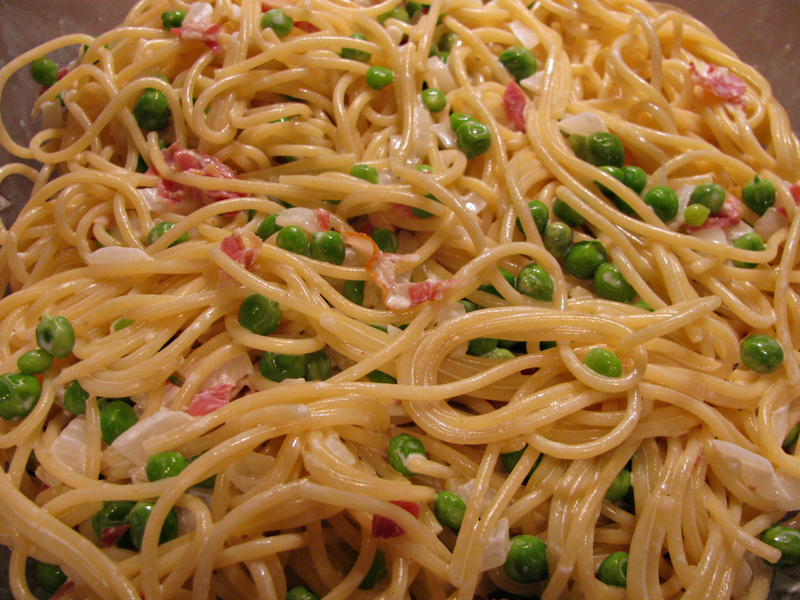 Delicate, sweet and salty and savory; the fresh peas burst in your mouth, the cream sauce is sinful. It was divine. P.S. A thousand thanks to The Pioneer Woman for tips on taking pictures of food, tips on using the macro setting, Photoshop encouragement, and generally being an inspiration. The pictures are better, no? Not great yet, but I’m working on it. 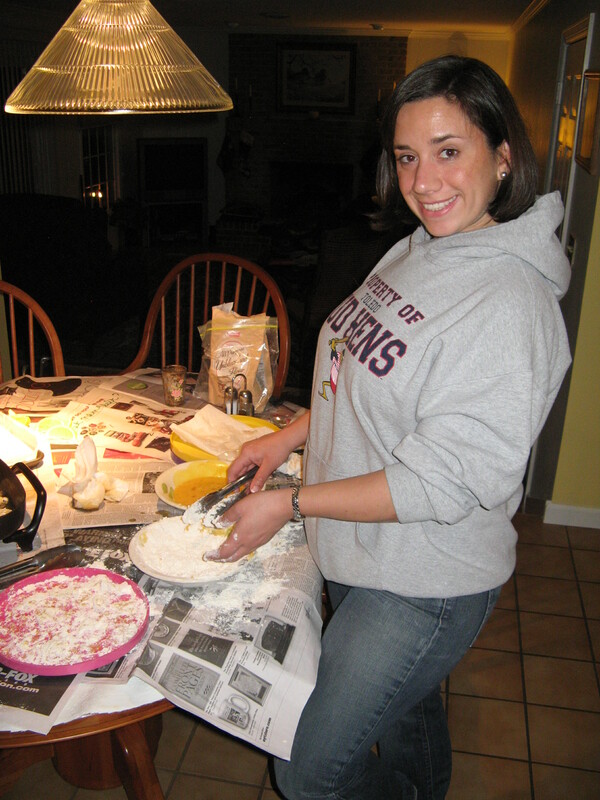 T and I spent Christmas 2009 with my parents in State College, PA. It was an adventure getting there as our original travel plan to fly directly to town were thwarted and we ended up landing in Newark, NJ on a completely different airline and then driving 3 hours to State College. This was the first time T had met my folks and he did great. I think they really liked him. We had a great week, visiting with cousins Amy and Griff (their travel nightmare from FL was nothing compared to ours), watching PSU bball, and eating, eating, eating. 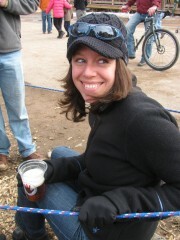 Oh, and throw in some Amish sight-seeing to round it out. I also finally got to see Betsy’s greenhouse. I’ve returned to CO with a serious itch to grow something and to write a book about the Sicilian tradition of the 7-fish Christmas Eve Dinner. T and I at the men's and women's bball double header. Both wins! 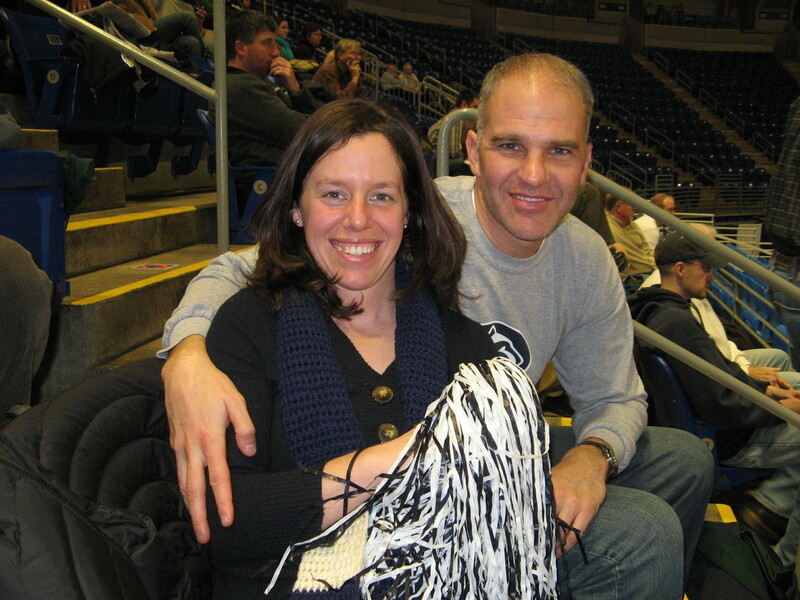 Go Penn State!T and I at the men's and women's bball double header. Both wins! Go Penn State! 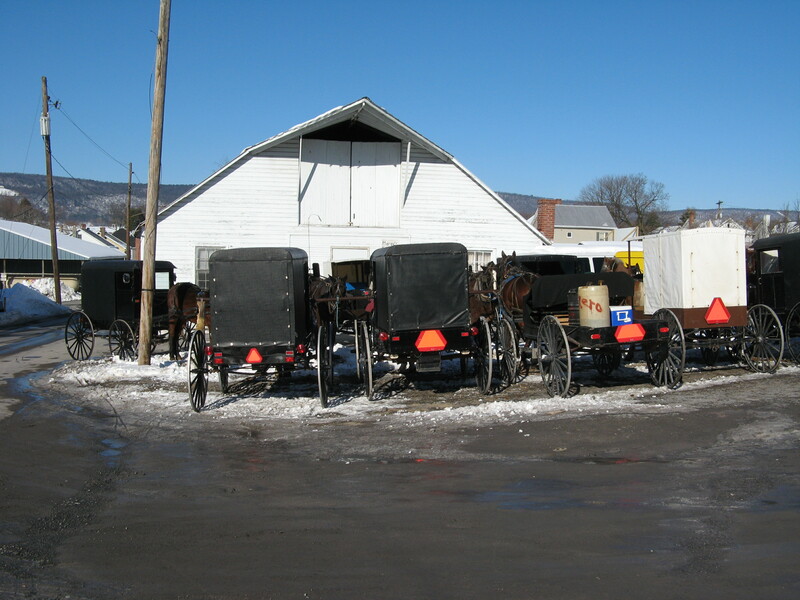 Amish buggies lined up at their Wednesday market. We walked around, checking out the few sellers and looked in at the livestock auction pit. Afterwards, we went to this local store, "Peachies", where I found chocolate stars (yay!) and mincemeat pie (not so much). 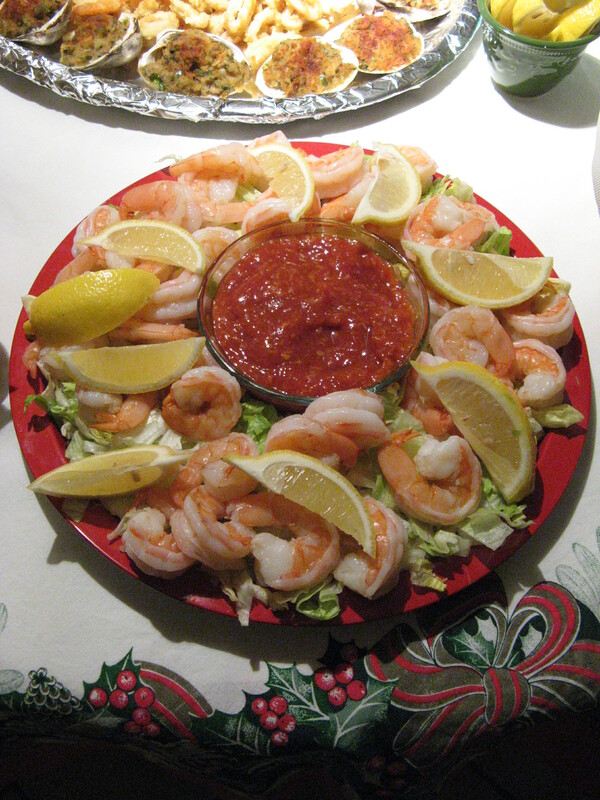 On Christmas Day we went to visit friends Betsy and Bob and check out the greenhouses. I want one, but guess I need yard to put it in first. 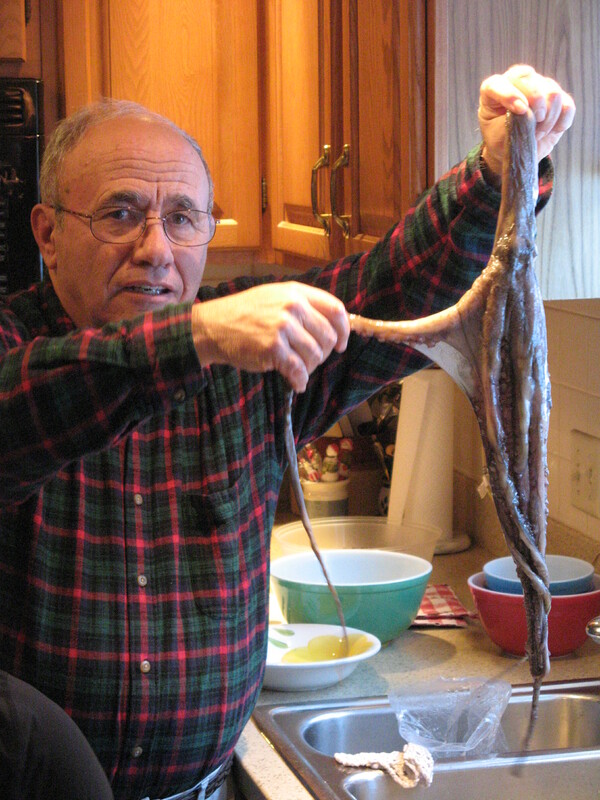 Dad and one of the two octapus we cooked for Christmas Eve dinner. 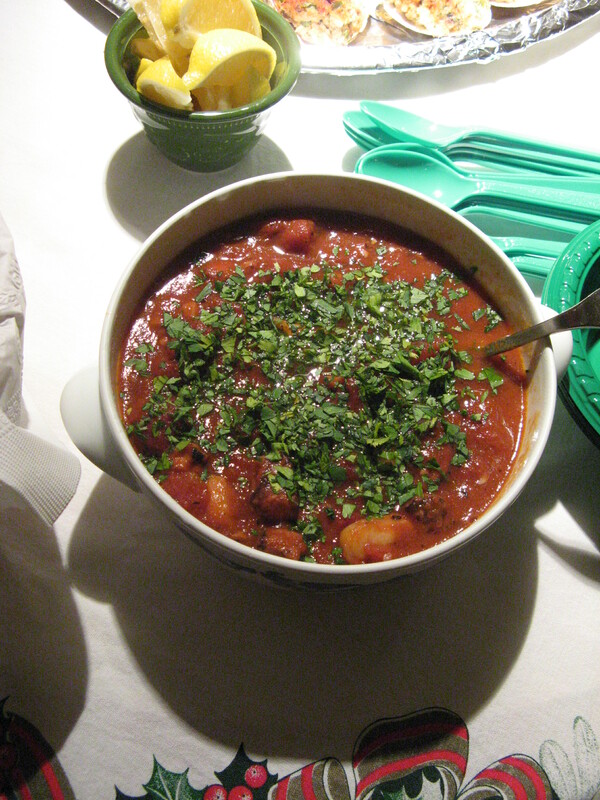 One was transformed from this into a fantastic stew with tomatoes, conch, garlic, and fresh parsley. 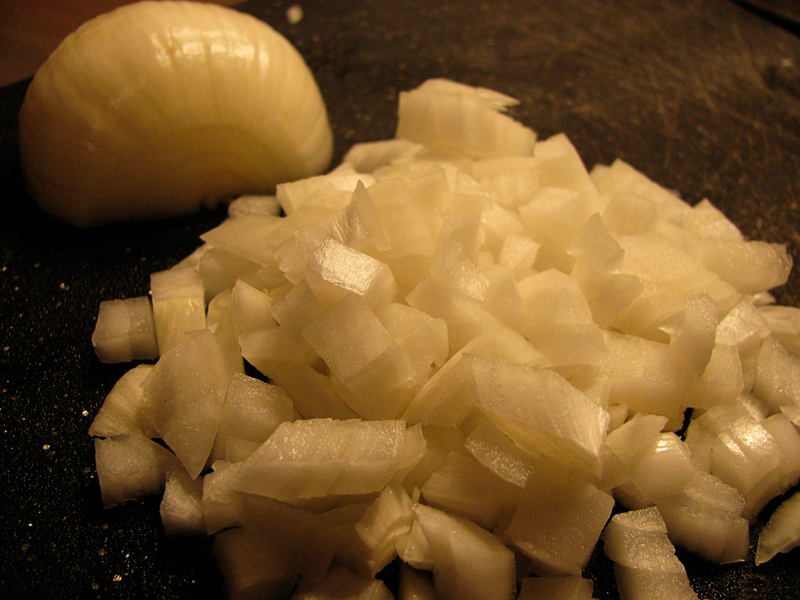 The other was cooked until tender and then chopped up with more conch for a room-temp salad with garlic, celery, peppers, onion, lemon juice, and olive oil. In an accidental twist, Dad added cilantro instead of parsley. It was still de-lish. 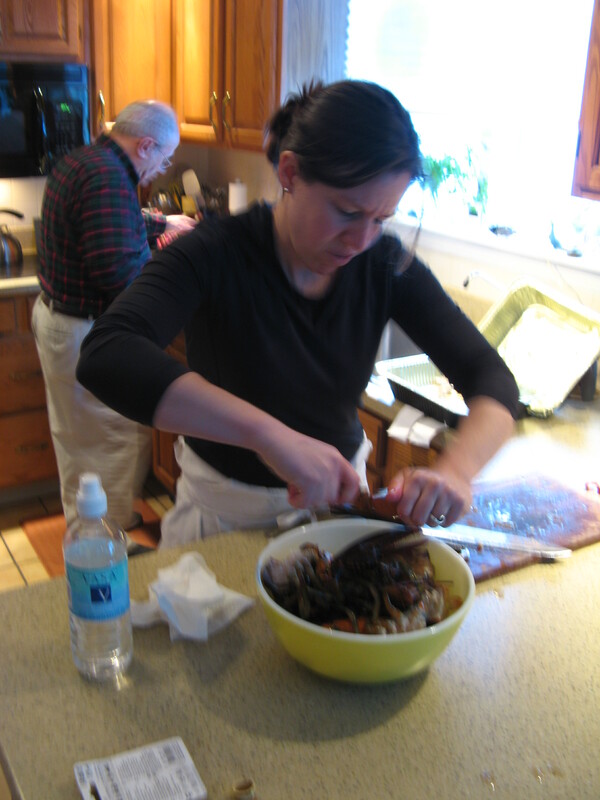 Sister Karen steamed clams and mussels and then fried shrimp, squid, and smelts. 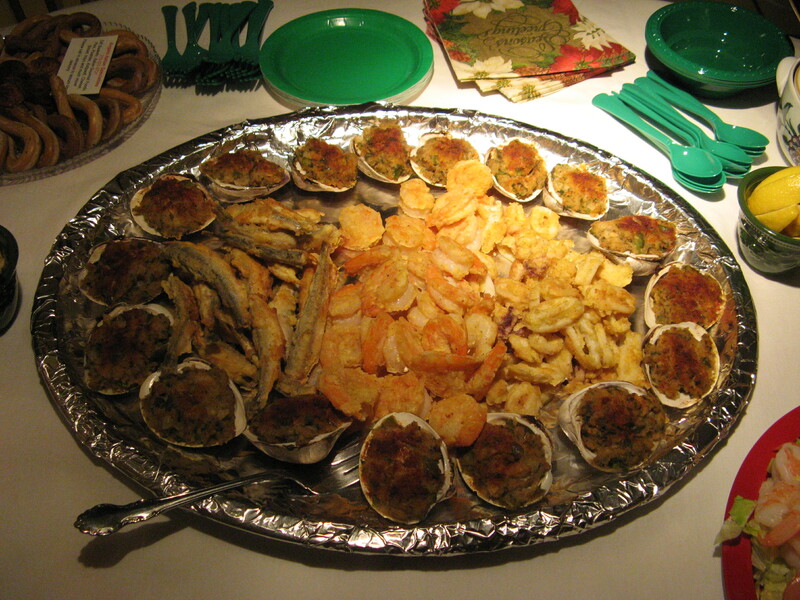 Fried stuff and mom's (should be) world famous baked-stuffed-clams. 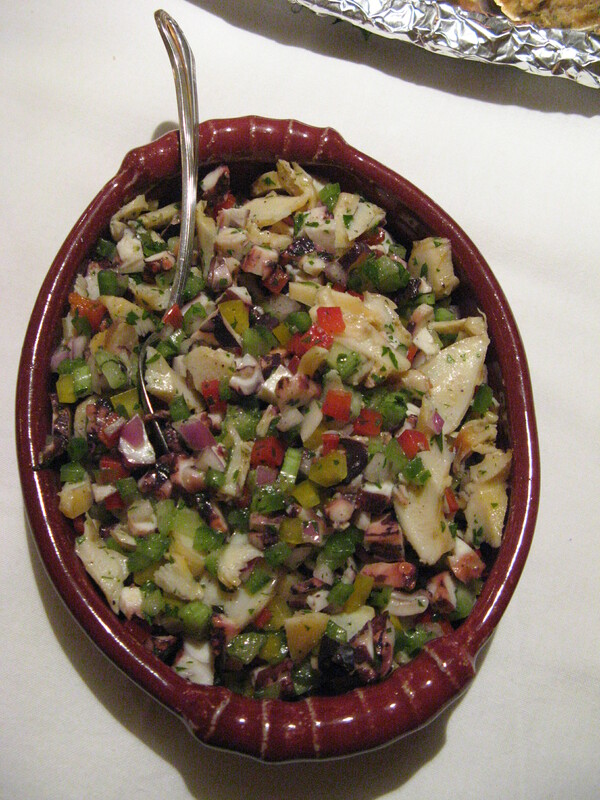 The octapus and conch salad. 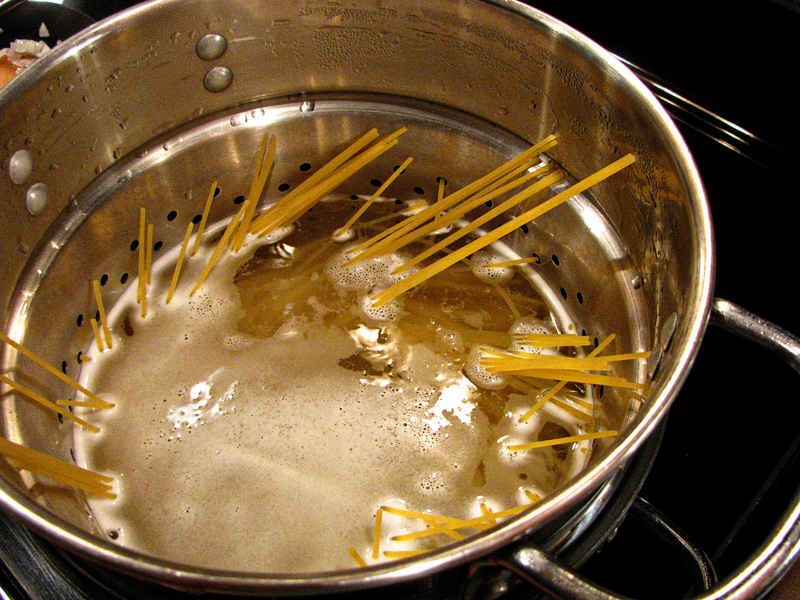 Linguini del mar. 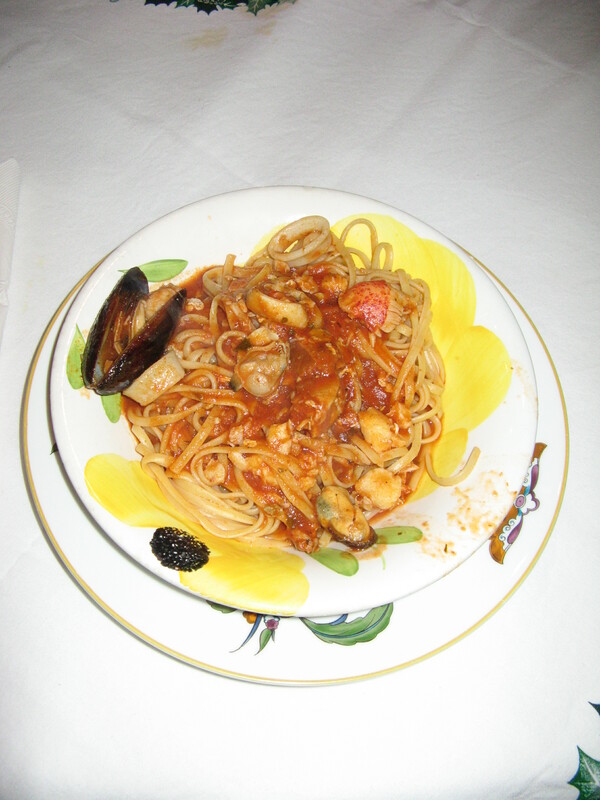 Mussels, clams, lobster, cod, tuna, squid, and shrimp in maranara sauce. One day last week, while I was staying over at Steve and Tina’s house with Selin and Gully (Steve&Tina were still in Florida), I guess Zoot got lonely and decided to come down for a visit. Zoot is my black cat, found on a lonely Cache County UT roadside on a Haloween bike ride. I was dressed as one of the three bears (my friends Carol and Deb another bear and Goldie). Out of no where, we heard this little mewing and there he was, a teeny, tiny black cat on the road. No mamma in sight. So, we stuffed him into the backpack of another rider in the group and went on with the ride. When it was over, he came home with me to stay. Zoot hanging out on Steve&Tina's back porch, garden and frog habitat (i.e., defunct pool) in the background. He hung out on the back porch like this for probably 30 minutes. It was really odd. Not that I've ever said anything about having normal cats. Zoot, looking a little cross-eyed. He's not really. Crowing over his ladies in the side yard. Hawkeye? Trapper? I can't tell them apart. It took a minute to get this shot. The white chicken is a hog and wouldn't pick up her head to smile for the camera. Whoever the rooster is from the first picture, this is the other one. This shot also shows off the beautiful hostas and plants in the garden. Tina has the greenest of thumbs. I’m staying at Steve&Tina’s with Selin&Gully for a couple weeks. Steve&Tina are in Florida. Today, the clouds cleared away and it was a beautiful, cool, breezy, sunny day. The garden is thriving. We think Tina misses the garden, so I took these pictures for her. It will all still be beautiful when she gets back. Plus, by then there will be more variety from the vegetable garden. Now, we’re eating lettuce, swiss chard & other greens, and radishes. Flower garden behind Steve&Tina's house. Walkway in the backyard. All of Tina's early spring weeding has really paid off. The peonies smell like cinnamon. 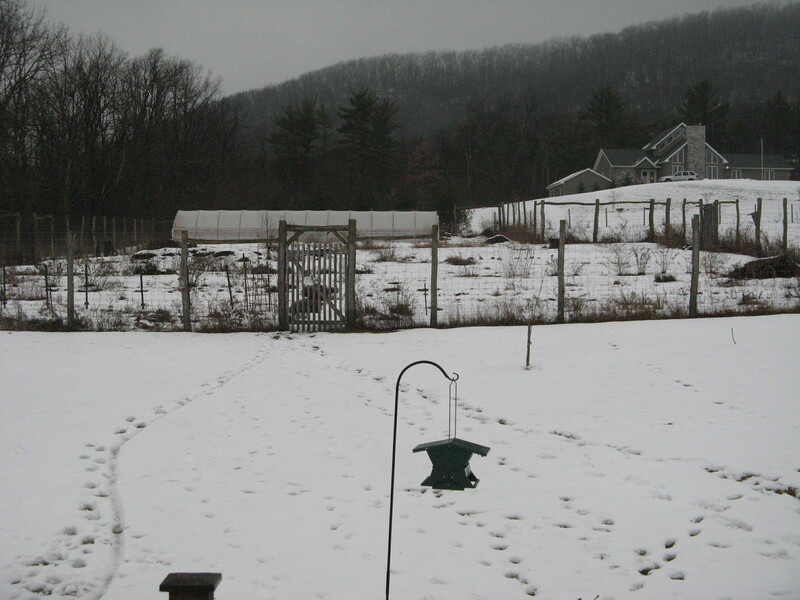 A panorama of the vegetable garden. Greens, cabbage, broccoli, cilantro, peas, tomatoes, tomatillos, peppers, eggplant, carrots, beets, swiss chard, leeks, shallots, pumpkin, zucchini, and today--5 kinds of beans! Another look at the vegetable garden. I'm 5'2" and my husband calls me "Pancake". Subscribe to The Short Stack!